Jahzara Saphir is a magazine that is devoted to helping engaged couples plan the weddings they have always wanted. 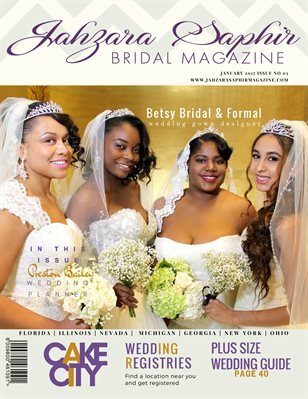 The magazine features articles on wedding planning, honeymoons, invitations, budget weddings, plus size bridal, makeup etiquette, real weddings, cultural wedding traditions, wedding beauty and fashion for the bridal party, bride, and groom, and wedding etiquette. Featured in seven states.